I finally got to go skiing last weekend. There is no other activity that I can think of that gets me outside in the fresh air, for a whole day, during the winter time. I can’t tell you how good I feel to be outside, in the sun and the snow, in the mountains where everything smells good, and moving. It’s such a luxury over these winter months. With skiing comes the need for snacks. Mostly the snacks are needed on the long car ride home when you finally sit down and suddenly realize that you are deeply tired, hungry and thirsty from all of that moving and fresh air. My go-to snack is granola bars. They are easy to keep in my ski jacket pocket, nutritious, filling, and have just the right balance of sweet and savory that I crave at times like those. 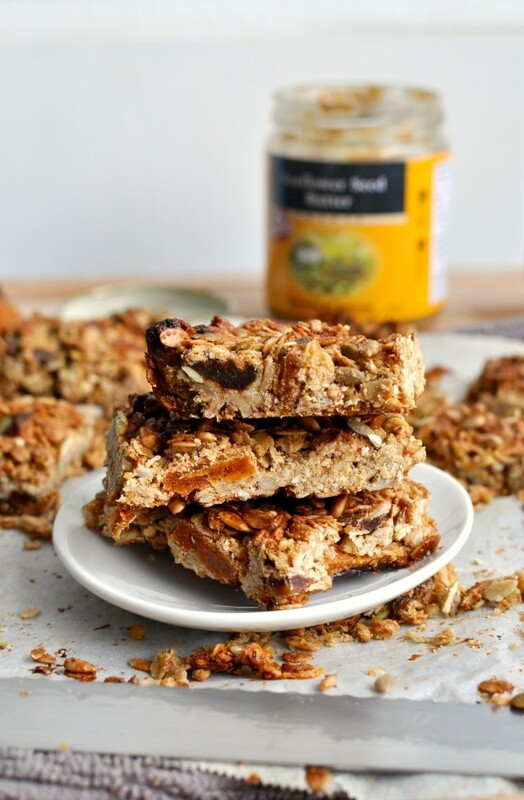 I have been making versions of these granola bars ever since the Smitten Kitchen cookbook came out. There is a date and almond version in her book but I decided to make some apricot sunflower granola bars this time instead. I have tons of sunflower butter in my fridge and I thought it would be a nice change. This entry was posted in Breakfast, Snack, Vegan and tagged Apricot, apricot granola bar, crispy granola bar, food, granola, granola bar, granola bar recipe, Healthy, healthy granola bar, healthy snack, nut free, nut free granola bar, nut free recipe, nut free snack, recipe, Snack, snack recipe, sunflower, sunflower granola bar, Vegan, vegan granola bar, vegan recipe on February 7, 2016 by mysecondbreakfast.